Reading and share top 2 famous quotes and sayings about Ferryman by famous authors and people. Browse top 2 famous quotes and sayings about Ferryman by most favorite authors. 1. "The Ferryman will transport us across the moat," Chris informed. "Yeah. This seems legit," Gabriella quipped as Chris helped her onto the boat. Andrew followed behind. "Are you sure this isn't a trick?" 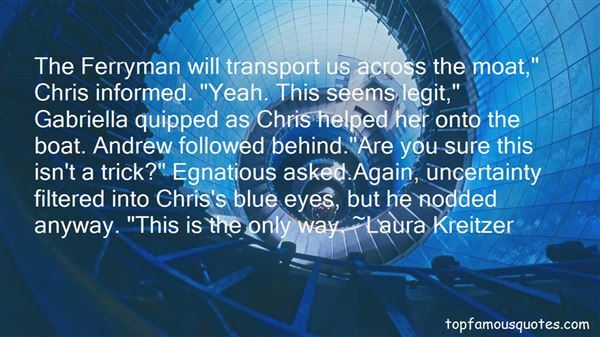 Egnatious asked.Again, uncertainty filtered into Chris's blue eyes, but he nodded anyway. "This is the only way." 2. 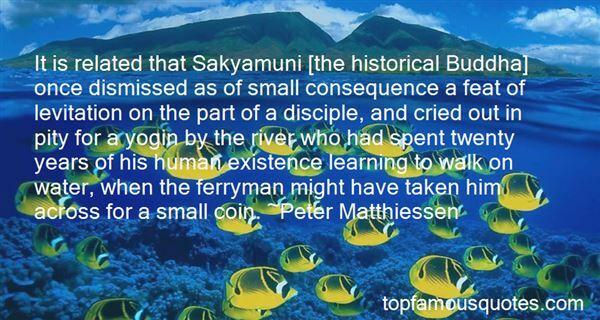 "It is related that Sakyamuni [the historical Buddha] once dismissed as of small consequence a feat of levitation on the part of a disciple, and cried out in pity for a yogin by the river who had spent twenty years of his human existence learning to walk on water, when the ferryman might have taken him across for a small coin." The Divine Voice is not always expressed in words. It is made known as a heart-consciousmess"